This is to amend the bad review I left prior. Okay so to start I need to apologize to you Chris, I most certainly jumped the gun with that first review I left. I let my anger and emotions get the best of me. Thanks to your efforts and quick response via email ( very shortly after writing that first review) I now have access to the APA course. I have just started to go threw the course and have only scratched the surface of it but so far it definitely looks like it is worth the money for all the content you receive with it. And is actually under valued if you compare it to other courses that cost more and give you less. Because I have only started and cannot really give a proper review of the material in the course I will comment on the customer service. I would honestly have to rate it 5plus stars. Right off the bat I had an issue and now that I think about it with a cooler head it was probably because of the crappy internet connection where I am currently that caused my issue. But none the less I emailed Chris and he did get back to me in a very timely manner and also he fixed the issue right away. I should also mention that this was on a weekend and also happend to be during a busy time for Chris because he was in the middle of moving. So very excellent service on your part Chris. I do apologize for being so quick to judge. Wish you all the best. Thanks for putting together such a great course for new aspiring traders like myself! Apr 15, 2019 - 5 Stars Just wanted to update the review I left earlier. I might have jumped the gun on writing it. I was able to get it all sorted out. Chris got back to me and sorted the issue out for me. I now have access to the course and like what I see so far. The 5 stars is for the amazing response time and resolution time of my problem. Keep it up! Apr 13, 2019 - 2 Stars I would like to start by saying I am very disappointed with what just happend. I saw all the great reviews about the advanced price action course so I decided to pick it up. I have had some pretty bad luck finding a legit course to learn price action trading and thought that this was going to be the one. I was mistaken so far. I can not say the course itself is not good because I have to pay for it. Let me explain. I totally LOVE this community! What they are giving out is absolutely priceless. I totally LOVE this community! I'll be always thankful to Chris Capre and his Jedi Sascha Gogolin for their precious work and time. What they are giving out is absolutely priceless, and I'm not referring just to the trading-related part of it. Since I joined this community, a full-360° "growing process" started (mindset AND trading-wise). After a year I can now see how I'm slowly switching from the "I need to find my holy-grail system" mindset to "I understand the best way to trade is to learn to adapt to price action context and the way markets continuously evolve". The former used to consume my soul and enthusiasm. The latter is motivating and makes me feel I'm approaching this as a profession, the right way. I still have a lot to work to complete this switch to a pro mindset, but I can finally say that this is the first time where my 6 months demo account is at breakeven instead of in deep drawdown. The nicest side of this, is that I'm now able to understand where I need to work on to move to the next step (from breakeven to profit). I definitely recommend anyone who intends to take trading seriously to give Chris a chance. For the money, it's 120% worth it. I have joined the 2nd Skies Forex in 2016 and I have been so happy with the contents that Chris provide us. I'm taking his Price Action course and Mindset course, and they really changed the way I think about trading and many aspects of my life. Chris put so many efforts and time on trading and creating the course materials. And he and his team are constantly trying to improve their courses. I really appreciate that. Whenever I contact him, he gives me thoughtful insights and supports. And I must say that the people in the community are willing to learn and very supportive, which also changed my image of traders. They are very polite, humble, yet confident. I am proud of being a part of the community. If you would like to be successful in not only trading but also your life, I highly recommend the 2nd Skies Forex. I took the Price Action and Advanced and it's an pretty ok course. If you are new to trading this will give you some basic knowledge. But if you been trading and taking other coursers this is not something new. I don't say this to bash the course but there is nothing new in trading generally. The Probem though for Chris is he is that traying to put it as there is something new by trying to "invent" new words like "role reversal", CVT, UVT, LLT and all kind of nonsens, making it unnecessarily complicated. He also spends way to much time bashing other traders who sell courses and praising him self. To sum it up, there is to much jibberish in the course, some lessons are old webinars with Q&A makes the "lessons" very unstructured. To much bashing of other traders(even Eliott Wave him self gets som bashing). When you are trying to reinvent the wheel it doesn't end up good. As always, we appreciate any feedback. However...there is no 'Shedda' in Sweden, nor any town with that name in Sweden (Shedda = African Continent in nature), so we are curious how you are posting from a town that does not exist. Be that as it may, here is our responses to your comments/feedback. Webinars aren't trying to be lessons by themselves. They are WEBINARS, where we cover lessons/topics, but also use it as an opportunity to answer student questions directly. However they are structured, and we even have timestamps for each part of the webinar, so the students can skip to any point in the webinar they wish. Hence I don't see why this is an issue. As to them being old, that is immaterial if they are of value. Old doesn't = unvaluable. If we find them valuable, we keep them. So again, I don't see what the issue is here. Perhaps you can clarify. When my students ask questions about it, I give my feedback. Isn't that the role of a mentor to do so? Regardless, I specifically state what my criticisms of EW are, but I also state there are profitable EW traders out there, and this is just my opinion. I also state 'why' and 'what' I don't find useful about EW, which people are happy to dialogue about, or at least see for themselves if they find those concepts in EW to be lacking, or sufficient. So I don't see the issue here other than me being a mentor providing my perspective on various topics my students ask questions about. We don't claim to be 'inventing' everything new per se, however we do claim to be offering a new perspective, or deeper perspective on the material in the course. I'm pretty confident nobody has gone as deep into explaining many of the methods, concepts and material we present in the course. If you can find someone, somewhere that has gone as deep with the material, please share as we've yet to find it. Regardless, the name 'role reversal' is not some new word (nor do we claim it to be). It's been out there for a long time. The other terms we use because we couldn't find a common terminology for what we were describing, so we decided to create our own to make it more universal for people to understand, since there was no consensus about such terms/concepts/methods/strategies. Really, out of the 60+ hours of lesson in the course, how much time am I talking about other competitors or traders? Maybe an hour at best? So 1/60th = "spending way too much time"? Really? 1.6% of the entire course is "spending way too much time"? That seems strange, but ok, we'll roll with it. In summary, I'm not entirely sure why these are major issues, but regardless, we've shown we make money trading, and our students make money trading. And that to me is the most important feedback we can get that our methods, our strategies, and course is helping students become profitable. If you have more specific feedback about what is 'unstructured' or why specific elements that are 'old' are not valuable, we are happy to dialogue about them and find a solution. All the best, and we look forward to your response. I have found 2ndSkies almost 2 years ago, at the very beginning when I decided I want to start learning how to trade. So I entered the course knowing nothing about trading and I am so grateful that it was this course that I found for many reasons, some of them are: The course is amazingly structured so you begin with the basics and after each lessons you have suggestions how to put it into the practice(for example identify environments on XY charts and post for feedback) and how to develop given skill necessary for understanding each concept, so its not just explanation, its also a path to develop your Price action reading skills. Another thing is that Chris really put emphasis on discipline, risk and money management, trade management and focusing on the practice, not results. Chris explains this so well that I was never tempted to go crazy with my risk/money management, it was made very clear to me that thats the fastest way to ruin what I am working towards. Just later in my journey when I started to hear from other traders how they struggle with these topics, I could really appreciate that I didn't ever had to go through that experience, thanks to this course. Another thing is amazing support via the forum and follow ups with Chris. In the forum you get feedback within a day from Chris or Sascha (another skilled trader with great people training back-round) or other members. You also get a free follow up Skype call with Chris and he went way beyond that and he is constantly engaged in our mail communication and he is really invested in helping me, I even got free follow up sessions and thats amazing value. I am not a profitable trader, so I made it to the top 8% of traders thanks to this course. And then there is the MINDSET course that has changed my life, not "just" trading. I started using the techniques described there not just for trading, but also in the sport I practice. I was always giving up whatever I was doing in sport and just moving to another thing over past 14 years, but after I understood the principles described in 2nd Skies Mindset course I was able to stick to one sport and this summer I ended up 2nd and 5th on my first nation-wide competitions, just because I apply same principles for my training there as I do in trading and I am now a professional athlete as well. 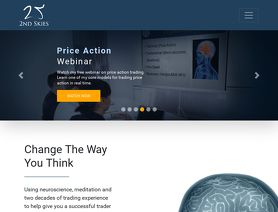 This is the first course I have come across that addresses how your mind operates in a trading context, and provides strategies to develop a professional mindset, and price action trading skills. The course has provided me with an honest reference point of my trading ability, and a better understanding of the work required, to challenge myself and achieve my goal of becoming a profitable trader. Personally, I have a lot of work to do, however the plan is to build up my skill level to access all of the available training programs, at my own pace with the support of 2nd Skies. This program allows you to have an honest look at yourself from a trading perspective, and provides a structured pathway to develop into a profitable trader. Membership provides access to the stated education resources, videos, forums, webinars, and the ability to post practices to obtain feedback on progress, and access to a community of like minded people. Best trading and mindset course out there ! It's the best trading course you can get ! The whole concept is explained thoroughly and in a simple and clear-cut language that everyone is able to understand and comprehend. You will be taught not only trading mechanisms but also how to apply them successfully via an optimized decision making brain. Chris Capre is definitely the best mentor I've ever had and I am honored to be his student. I found Chris Capre while searching for more details about Ichimoku, and what made me take a risk on paying hard earned cash to sign-up was his reasons why he wanted to share his time teaching professional trading to retail traders. I admit that I was sceptical, as I have come across a lot of sharks, a few who have bitten me, however, I am happy to say that to date Chris is no shark. Trading is a very personal journey and the course’s delivered by Chris is just one interpretation which I am finding extremely helpful, others may not; it is making me think about positions, my psychology to risk and looking at charts without indicators i.e. naked. Looking at charts and being able to read order flow, momentum, stop loss zones etc. without indicators gives you confidence, well it does to me. If you want to learn from a professional trader, then Chris is worth a shot. ATM v1 was really good but unfortunately v2 was a waste of time. Can you be more specific regarding what about the last 6 out of 18 lessons (V2) that you didn't find useful? Just curious because many people have felt their trading mindset improve heavily from these lessons, so always curious about the specific feedback you have with this. Let me know and hope all is well. We appreciate the feedback here. However, it seems you're not really giving feedback that seems accurate regarding our price action course. This is not accurate as we've given two seminars this year, and already announced the third. We missed one this year with the passing of my father, which I apologize for missing, but it seems like I should be given a pass on this one. Really? What parts specifically? We're happy to take any feedback regarding possible site improvements and user functionality, but the overwhelming comments are not about the 'site being horrible to use', nor its functionality, so if you have specifics, we're happy to hear. Hmmm, this is explicitly stated in our price action course page here (https://2ndskiesforex.com/advanced-price-action-course/) in the 3rd section "50+ hours of VIDEO LESSONS" so we're very clear about the format for the lessons. We do actually have text lessons, along with our daily trade ideas and market commentary, which is all text. However in terms of the lessons, the majority of them are video based because we feel it's a much more interactive form of content and training that I can convey a greater message through vs just text. We do have English translation/closed captions available on our lessons. Now I'm guessing you didn't email us ahead of time asking if the lessons are text or video, because if you did, I'm 99% sure we'd have told you the lessons are mostly video based. I cannot remember a time where I said otherwise, so if text lessons was so important for you, wouldn't it be your responsibility to find out ahead of time how the lessons are presented? Hence I'm not seeing how we've made a mistake here - perhaps you can clarify. Hmm, I have over 20+ live trade videos of me using my own money showing how I'm using the same methods in the course. So I'm not sure where you get this idea of 'example or two'. If you're talking about specific concepts in the lessons, we've covered every concept and method dozens of times over the course of 60+ lessons we have. When you look at the lessons, the webinars, the live trade videos, the Q&A videos I did, and our daily market commentary, we've provided dozens and dozens of examples for any lesson, topic or method we use. So your comments here don't seem to accurately reflect what is in the course here. Perhaps you can provide an example. What does me working on my new project have to do with our current online trading courses and training? I'm in our forums every day. I'm paying for developers to improve the course every day. I'm giving feedback and working with students every day. So what does my new project with NeuroTrader have to do with a course review? Unless you can provide specific examples of how the site is hard to use, that we have no text lessons, that we only have a few examples, then your feedback doesn't seem reflective of reality. We're happy to hear any follow up comments and examine any examples you can provide.